This policy brief (April 2016) from Pro-Health 65+ reveiews the research domain and outlines potentially effective strategies for using health promotion and prevention to improve health for seniors. It looks at research as well as previously implemented interventions to formulate its policy recommendations. The analysis found that the most effective actions included some form of involvement in physical exercise or activity, and that health education and communication, to improve health literacy, may also be effective. If you think “aged”, “senior” and “elderly” are negative buzzwords, think again! Businesses, large and small, have begun to use the ageing market as a lens through which to view their strategic plans, according to the World Economic Forum report How 21st-Century Longevity Can Create Markets and Drive Economic Growth. Contrary to common negative perceptions, older adults are creating a new niche market and fuelling growth and innovation. This issue examines how individuals, businesses and societies will navigate the previously uncharted waters of rapidly ageing societies. Among the experts interviewed are faculty, companies, small business leaders and standards professionals from around the world, in fields ranging from robots to community infrastructures to aesthetic surgery services. The Centre for Ageing Research and Development in Ireland (CARDI) has published a new policy paper on how innovative policy decisions can contribute to planning for an ageing population. Innovation in Policy: Insights for Ageing examines what makes an innovative policy and what are the challenges in implementing that policy. The paper also presents three international case studies of both successful and unsuccessful policy innovations. Most innovations are incremental in nature, involving relatively minor changes to existing services or processes. Innovation can be driven by a wide variety of things, including public need, new research, legal necessity, lobbying, new technologies or social innovation. The success of an innovative policy depends on many key factors and considerations including public interest, effectiveness, efficiency, fairness and equity. Policy innovation can provide a solution to the challenges arising out of the globally ageing population and contribute to policy preparations for demographic change. In 2012 Eurochild conducted an on-line survey on the contribution of grandparents to families across Europe. The study gives an overview of family policies with relevance to grandparents across EU countries and identifies key policies that recognise grandparent care and support, and which strengthen the extended families from children's perspective. The report also profiles what Eurochild's members and partners are doing in relation to support grandparents, and gather some useful evidence on the services offered to them. A report released by the International Federation on Ageing (IFA) calls for increased public education and awareness programmes, improved public policies and greater integration of preventive eye health interventions into public health systems. The joint publication of UNFPA, the United Nations Population Fund, and HelpAge International, a global network, represents the collaboration of over 20 United Nations entities and major international organizations working in the field of ageing, reviews policies and action taken by governments and other stakeholders since the Second World Assembly on Ageing in 2002. It also provides good practices, projects and programmes addressing the challenge of an ageing population. This brochure, published in November 2012, provides a broad and comprehensive overview of all EU actions and their legal context in the field of active and healthy ageing. The aim of the publication is to help older citizens to understand how the European Union functions, how decisions are made, and thereby enable them to get better involved and influence the European policy making process. The guide consists of three main chapters. The first chapter describes the political context and legal framework in which decisions are taken whilst the third one presents the EU institutions and the decision making process within them. The second chapter elaborates on EU initiatives currently being implemented. A compendium of programmes, good practices and other resources for promoting and sustaining the well-being of 'younger' older people, with a specific reference to socially deprived and migrant groups in Europe. Published in 2012 by EuroHealthNet and BZgA. 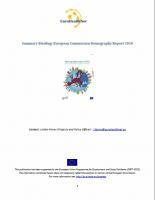 This publication is produced by the European Year 2012 Coalition. A french and italian version can also be found on the website of the European Year 2012 Coalition. Age Platform's statement for the 2007 European Year of Equal Opportunities for All.